– Sensors are simple energy saving controls that will help you meet energy reduction targets in new and existing buildings. They may provide ‘standalone’ control of a single luminaire, a full lighting circuit, or may form part of a building wide control system. The principle is the same: using the right type of sensor in the right location can reduce the amount of time that lighting is left on unnecessarily, for example when an area is unoccupied, or when there are good levels of natural light. Almost a fifth of global energy use is on lighting, equating to a demand annually of around 2,650 terrawatt hours. A significant proportion of this massive energy use is totally wasted when lights are left switched on when a room is unoccupied, or when natural daylight alone can provide sufficient light. Hopefully we can clear up some of the confusion in this post! Energy saving sensors can work in various ways. 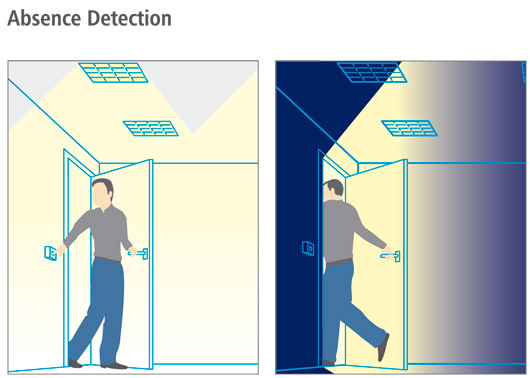 Basically presence and absence detectors are both types of occupancy or movement sensor as they monitor a detection zone for movement, signalling occupancy. When set up as a ‘presence detector’ the sensor will automatically switch lighting on when movement is sensed e.g. when a person enters a room, and then turn it off when no movement is sensed. A presence detector can be used instead of a conventional switch. An ‘absence detector’ requires the switch to be turned on normally when someone enters a room, but the detector senses when the room is vacated and switches off the lighting automatically. These sensors monitor movement and turn lighting on or off according to how they have been programmed. These types of sensors can also be used to control heating and ventilation loads. These are presence or absence detectors that also provide dimming functionality to control the light output of light fittings with dimmable ballasts. 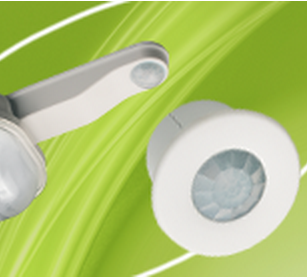 This allows greater flexibility in the illuminance offered. For instance, internal corridors, instead of switching ‘off’ when no movement is sensed, may be programmed to turn the lighting to a low level, but then to dim up when someone enters the corridor. Similarly in open plan office areas, where someone is working after hours, their particular zone would be fully illuminated, but instead of wastefully lighting neighbouring zones, or leaving them in complete darkness, the system may be programmed for low level lighting until the building is totally vacated. Light level sensors detect ‘lux’ or light levels. Some sensors read light levels only, whereas others can detect lux levels as well as detect occupancy. Energy saving sensors with light level detection can be programmed for instance to turn the lights on only if there is insufficient natural light available. ‘Light Harvesting’ is a term that is used for a system that is programmed to maximise the use of natural light available via windows and skylights, and that ‘tops up’ with artificial lighting only when necessary. Not sure what sensor can deliver the results you’re after? Wanting some ideas for saving energy in your home or workplace? Give us a call and we’ll be happy to advise on the most cost effective solution, or how a particular energy saving technology will best suit your needs.